Many of these zombies are variations of a few standard types: the nigh-unstoppable behemoth, the jittery quick one, the one who yells and attracts more of its kindred, the one who unleashes toxic fumes through one or more of its orifices, and so on. When confronted with the sheer number of zombies out there, what choice has one but to play favorites and rank them? I’ve faced off against a lot of these jerks over the years, and I’ve finally managed to narrow down which undead creeps really stand out in a crowd. I’m lumping together all of the iconic video game “zombies” that are actually unlucky folks infected with parasites or controlled by a living host. Horror fans have been at war with each other (okay, I’ve been at war with myself) regarding what exactly constitutes a zombie ever since Danny Boyle unleashed those rage-infected pseudo-zombies in 28 Days Later. To me, a zombie is someone who dies and comes back to life (or unlife, or whatever you want to call it), but I would be remiss not to mention these hostile cannibal-types. In Half-Life, they’ve got a bad case of Headcrabs. In The Last of Us, they’ve got fungus growing out of their… well, everywhere. In Left 4 Dead, they’re the the charging, noxious, bloated archetypes that have become all too familiar in the zombie genre. They may not be “undead” by the strict definition, but I’m breaking my own rules to include ‘em because I love ‘em. I especially love The Witch of Left 4 Dead because the way she sits in a dark room in her underwear crying over one thing or another really takes me back to my college days. Zombie apocalypse or Black Friday? Before Dead Rising hit Xbox 360 in 2006, zombies were a scary but manageable video game nemesis. The undead of Resident Evil, for example, could kill you in any number of ways, but they simply didn’t have the numbers to give that truly overwhelming apocalyptic feel. This all changed when photojournalist Frank West landed at the Willamette Mall as he searched for the cause of the deadly unrest in a Colorado town. Sure, Dead Rising is goofy. It’s endlessly amusing for West to recount his grim past (he’s covered wars, you know) whilst clad in short shorts and a half-shirt, or to cull the zombie horde with an electric guitar. But that horde is what sets the game apart, and what makes it terrifying. One undead jerk is easily avoidable, but there are more than 50,000 zombies in Willamette. They might be slow, but they will never stop shuffling towards you, reaching out in their unearthly hunger, like me when I’m in a room with a pizza. Undead Nightmare, the zombie-laden expansion to the western open-world RPG Red Dead Redemption is a comedy-horror masterpiece. When the undead rise and get all mean and bitey, John Marston has to find a cure to save his wife and son from turning. Marston returns a cursed relic to its resting place deep in a Mexican catacomb and all seems well, up until the point that graverobber Seth steals the mask, setting the rising in motion again. Marston, who was dead by this point after the finale of Red Dead Redemption, claws his way out of his grave, mounts his spectral horse, and sets off for adventure once again. It’s a cheeky epilogue to the terrific DLC, and a rare opportunity to play as one of the walking (or horse-riding) dead. Nazi zombies (or zombie Nazis) have been a horror-movie staple since the 1970s with good reason: they’re the ultimate enemy force! There’s no questioning that they’re the bad guys. There’s no “Aw, I feel bad killing these undead because they were human once,” because they were just as villainous—even more so—when they were alive. Sniper Elite spinoff Zombie Army Trilogy plays this concept to the hilt, throwing all sorts of Nazombies (I just made that up) at the player’s resistance fighter. The supernatural sharpshooting extravaganza builds to a showdown with the evil so evil it’s like evil squared: a giant-sized zombie Hitler. Facing off against his oversized, super-powered head is as absurd and over-the-top as the finest Z-grade horror cinema. It’s also surprisingly cathartic. ZombiU (or Zombi, depending on the platform) is challenging and scary as all heck. Fighting your way through the masses of angry undead as you try to escape London may sound like business as usual for a zombie game, but the delight is in the details. The undead are plentiful. They’re also angry, aggressive, and tough, while the player character is none of those things. You’re just an average citizen armed with, say, a cricket bat or a handgun that has but three shots left. Avoiding the zombies is key, but it’s not easy when they lurk everywhere, in wide open spaces and pitch-black rooms. Something as simple as checking your inventory is a nerve-wracking experience and can easily get you killed, for the game doesn’t pause while you rifle through your backpack. You will die from a single bite, but ZombiU puts a terrific twist on the roguelike formula. You spawn as a new character, and if you want all the goodies your last character was carrying, then you have to retrieve them. This means returning to the place where you died and more than likely facing off against your last character, who has risen as one of the undead. It’s a strange and uncanny thing, putting down the person you were, the one you tried so hard to keep alive. It feels like a mercy. Dragon’s Dogma is a quirky, vastly underrated take on open-world western RPGs by the Japanese developers at Capcom. The game world of Gransys is full of all manner of monsters and ne’er-do-wells even during the day, but the night time is the right time for things to get really dangerous. When darkness falls, the ghosts come out and the dead rise—and I do mean rise, right out of the ground the way good zombies should. Overall, they’re my favorite type of game zombies as they’re similar to my favorite cinematic zombies: those of the Italian horror films of the late 70s and early 80s. They’re rotting and relentless and they most certainly do not run. They do, however, moan and speak, which absolutely induces both heebies and jeebies. Hearing a plaintive “so cold” or “I’m hungry” in the dark also suggests that being a zombie isn’t as fun as it looks. Lee in, uh, happier times. In the first season of Telltale’s Walking Dead series, players take on the role of Lee Everett, a decent man doing his best to navigate a world in the midst of a zombie apocalypse. 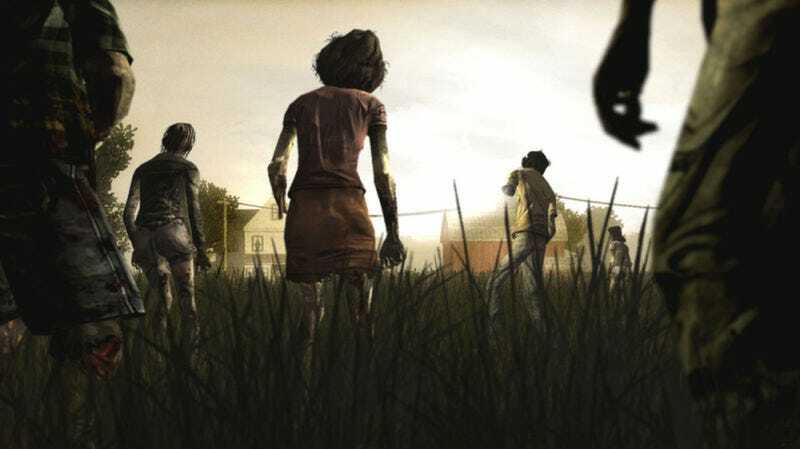 He becomes the leader of a small and ever-changing band of survivors, including a young girl named Clementine, with whom Lee grows especially close. No one gets a good ending in the world of The Walking Dead, but Lee’s was particularly heartbreaking. He did the best he could in horrific circumstances. We came to know and love him over the course of Season One’s five episodes, and we watched his bond with Clementine grow deeper. She was the daughter he never had, and he was the parental figure she desperately needed. In the end, Lee turned. In the end, Clementine was forced to make a terrible decision: put him out of his misery, or walk away. In the end, I was an emotional wreck. The announcement trailer for the horror RPG Dead Island isn’t simply one of the greatest game trailers of all time, it’s also a brilliant zombie-flavored short film. Intercutting clips that play out temporally backwards and forwards, the 3-minute trailer relays the tragedy that befalls a family vacationing on an island that becomes overrun with the undead. The shocking, violent horror is juxtaposed against a beautiful, calm track composed of piano and strings. The effect is so evocative, I end up a blubbering mess every time I watch it. Ultimately, the game didn’t live up to the lofty emotional heights on display here, but we’ll always have this trailer. You can’t spell “Resident Evil” without “zombies.” Well, yes you can, obviously. But zombies are the rotting, putrid meat of the itchy, tasty Resident Evil stew. The original game spends a little time building tension and mystery before introducing them, however. Rumors abound regarding murders that have taken place in Raccoon City and the forest beyond; small groups of people are wandering about and attacking without warning. Even worse, they eat their victims. STARS Alpha Team is called in after Bravo Team disappears while investigating Raccoon Forest. Alpha Team finds body parts and mean mutant dogs in the woods, and takes refuge in a quiet, empty mansion. Is it abandoned? What happened to Bravo Team? And who are these “cannibal killers”? Finally setting off to explore the mansion, you quickly run afoul of the true danger. There’s someone—or something—chewing on the corpse of Bravo Team’s Kenneth. It slowly turns to look at you, then rises and lunges. There are countless mutated creatures in the Resident Evil universe, but that lone meatball-headed zombie is the icon who started it all. The members of STARS would never be the same. Neither would video games.